Getting certified has never been easier! We are proud to offer American Heart Association web-based E-Learning training. 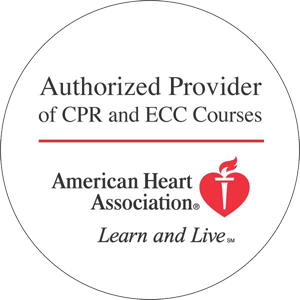 Online/blended classes are available for ACLS, PALS, Healthcare Provider Basic Life Support (BLS) CPR and all Heartsaver CPR/AED and First Aid classes. After completing the interactive training video, students will complete a skills session to complete the course and receive their American Heart Association certification card. Skills sessions generally take an hour or less and the certification is the exact same as those who take a traditional classroom course. TO GET STARTED select the course you would like to take from the right side bar or below. Contact us if you have already taken the online portion and want pricing for a skill session only or if you would like CPR without First Aid.